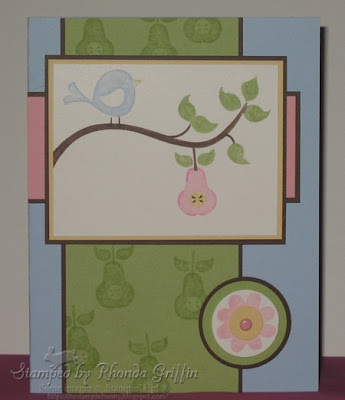 This little card using the Cheep Talk set was made using Designer Series Paper from the Sunshine Garden SU! 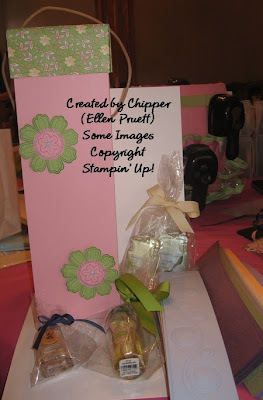 Simply Scrappin' Kit and a sketch I found on the Scrapbooks etc., website. 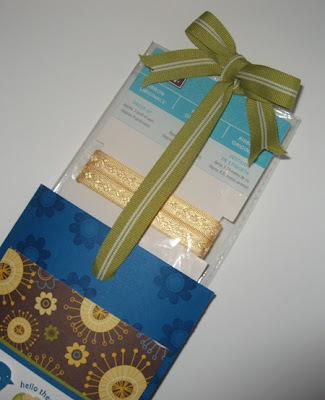 I used the So Saffron Striped Grosgrain and the trio punch....a snippet of Celery Wide Grosgrain accents the top left corner of the main image. I finally decided this will be the fourth project at Class on March the 6th....We will start with a regular-sized card, and cut off the one inch scrapling for a bookmark. It is easy to do, and it is perfect for the green/recycling theme of the class :). Kind of a giggle that it is a tree too...save a tree! I love this set...Branch Out is a lot of fun to stamp and almost as impossible to "mess up" as the retired set Roses in Winter! My card was inspired by the square cards posted last week by Beate and JanTInk (listed in my blog roll), but they really aren't CASEs. Using a rounded tab punch for the top of the scrapling bookmark (which is what delayed my designing) came from Inking Idaho/Becky Roberts. TFS ladies! Things I made as gifts for my Swappers Anonymous Cupid Chipper. 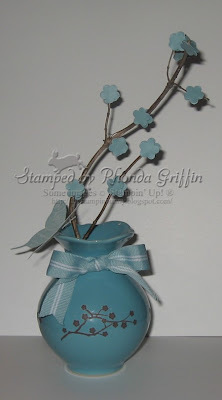 I chose this tiny Baja Blue vase because I CASE'd the idea from my Christmas Elf Liz (ececsy on SCS). Both my cupid, Ellen, and I love Baja Breeze! I enjoyed finding a branch from an elderberry bush in my yard to replicate the branch in the run-ons. Tied a bow and add the butterfly from Simple Friendship for a little more interest. 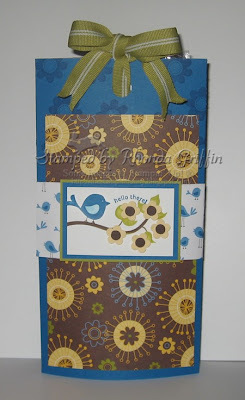 This new Parisian Breeze paper is so pretty, so I included a version of Beate's Ghirardelli square box--no need to wrap it in designer paper when it is made of the new Cardstock weight double-sided paper....it is pretty inside and out! This is a Genie bag (named for Genie1314), and the new Big Shot Texturz plates are the perfect size (a bit larger than a card front) for covering a white lunch bag as a gift bag. 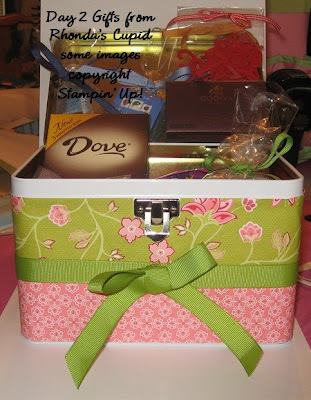 This altered tin uses the Rockabilly Designer Series paper....I am surprised how quick it was....Perfect for holding chocolate candy! 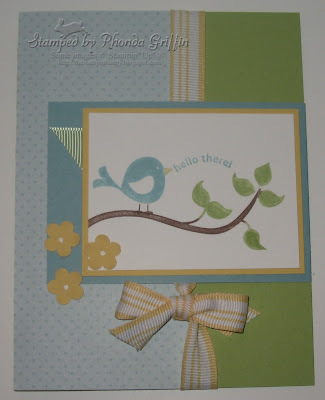 Pull the bow and the ribbon originals appear....I love that sweet bird from Cheep Talk and the Good Morning Sunshine designer series paper. Please scroll down to see the gifts Chipper gave to me...they are so fun and wonderful....We just happened to have each other...that isn't usually the case. My Brilliant Cupid is....Chipper/Ellen Pruett! I got Pear (yum!) shower gel, vanilla sugar hand sanitizer, mandarin shower gel and tons! of Swirly die cuts and Peace Love Hope and Joy diecuts! Amazing! 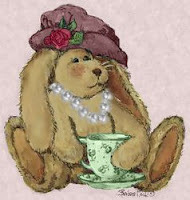 Now about the gorgeous Tea Party box........DH and my girls were looking at it, and I said hmmmm, we really don't give anyone wine as a gift.....and DH said....she put the strips in so you'd know to store the Big Shot stuff that size in it dontcha think? Oh my! How stinkin' smart is that? Even the thick/tall piece fits with the lid slightly lifted....see?! Amazing! 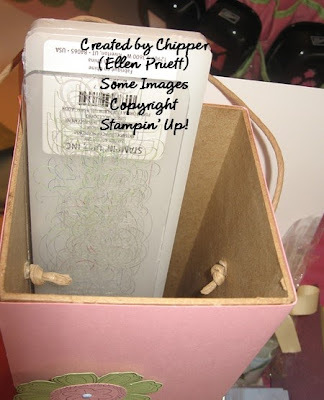 Thanks so much Chipper/Ellen! I LOVE it and all your great gifts! I have 7 bags of adorable Billboard Big Shot alphabets, rainkissed leaves Bath and Body works lotion and shower gel, B&BW lip balm and hand sanitizer, Cinnamon Jelly Hearts, Godiva Truffles and a BIG Blueberry Almond (I love fruit and chocolate) Dove bar! 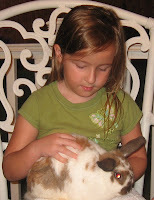 See why I have swapper's anxiety! You were too generous cupid! Wowie! 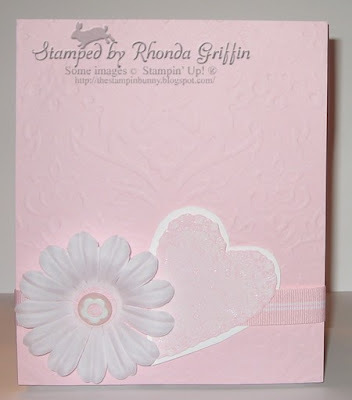 I was so excited when I saw this cute hinged card idea from Stampin' Up! I immediately CASE'd it for the WT205 on Splitcoast which was to use fabric on your card. I think this is a pretty print, and it happened to have some squirrel-like brown as the background color, so I frayed the edges and glued it with mono liquid glue in the green bottle. It also coordinated with the Simple Friendship set I think so I stamped the flower on the top in Versamark on Celery. 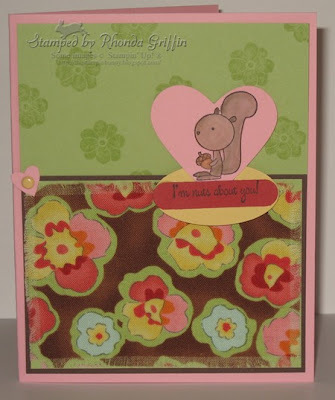 I needed to make my 3 year old daughter a Valentine so I used the Squirrel from the Animal Crackers set for the main image....fun and fast to make! We Swappers Anonymous demo friends are having a cupid exchange. (My gifts to my cupidee will be posted on Sunday.) Today was the first day to open, and I have a rockin' cupid! 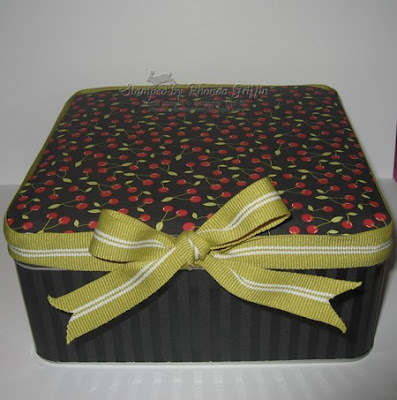 That isn't all--Look at this adorable little wooden handle box covered in the Tea Party striped paper with a Playful Petals flower on the front! How stinkin' pretty is that?!! Inside? Inside was Bath and Body works shampoo and conditioner in mango mandarin scent. yummy! For today's Inspiration Challenge on SCS, I chose the pear and apple lampshade shown here http://www.hunkydoryhome.co.uk/hunkycat/retro-fruit-pendant-drum-p-590.html as my inspiration. 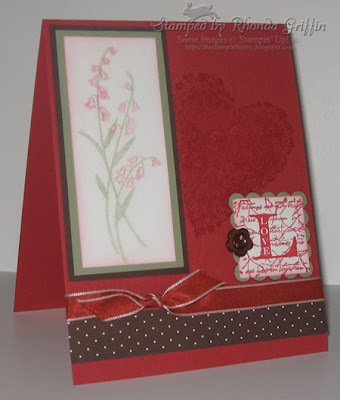 I found a recent Sketch Challenge (#213) for the layout and used Cheep Talk for the stamp set. I enjoyed using the pears in versamark on the Certainly Celery to repeat in a slightly different spacing from the shade, but used similar colors omitting only the red. I rock and rolled the edges of the pear in Pixie Pink after inking it with Pretty in Pink. The pink pear is unusual, and I love this fun set! 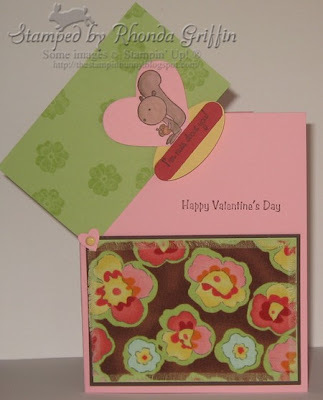 I wanted to show off Poppin' Pastels, but I wanted a heart on the card too, so I just stampedthe heart in Versamark as a background on the base of the card. It does make the card look quite different and yet the same as the layout I used on the Real Red and Mellow moss card on my events blog.